Close your eyes, take a deep breath and remember those pleasant times in the past when you were so at ease. Just think how comfortable you felt. A precious moment that you want to relive again. This is our reason to be and the reason why we created Wanda Panda We want our designs to enable you to experience that sensation each day. 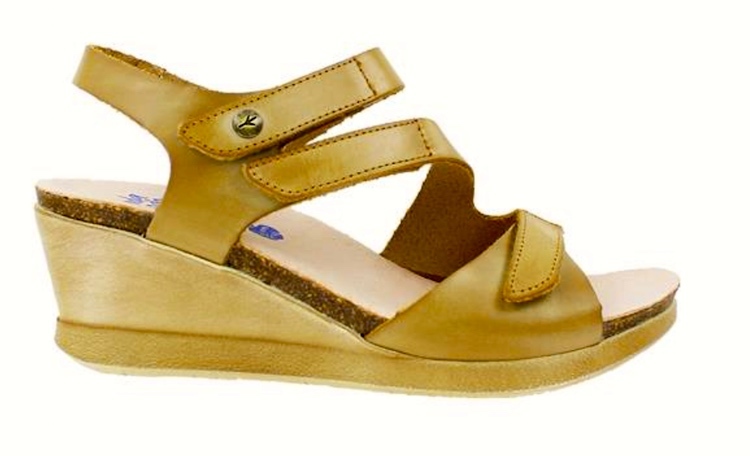 A footwear line inspired by the Mediterranean breeze. They will become part of your style, the way you dress, and your own charisma as soon as you start wearing them. 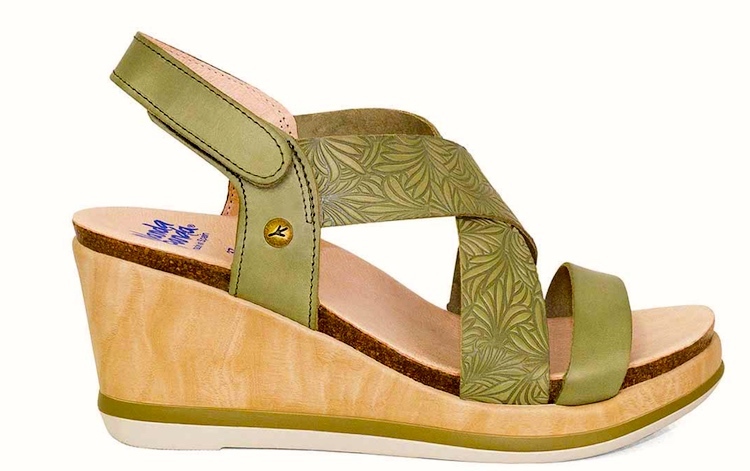 Wanda Panda is a fun, energetic brand with beautifully crafted shoes for women made in Spain. With a focus on travel, nature and people, they craft their cork shoes in a way to bring happiness to anyone who wears them! [Digression on English spelling. One of the little (well-known) regularities in the Englisjh spelling-to-sound mapping is that in positions where the letter A would be expected to have the pronunciation /æ/, it is instead pronounced /a/ when it follows a syllable-initial letter W (representing /w/). This is a remnant of a historical sound-change, and the details are not immediately relevant here, but the effect is quite general. 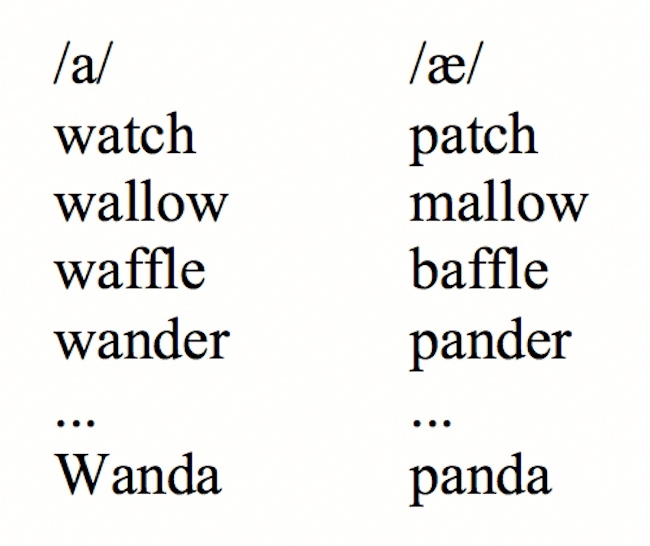 Here’s a small table of representative words with a syllable-initial labial consonant followed by the letter A in a position where A would normally be pronounced /æ/. In the first column are words beginning with the labial /w/; in the second are words beginning with other labial consonants /p b m/; the paired words are otherwise identical in spelling; in the first column, A represents /a/, but in the second, /æ/. In any case, in Spain, Wanda Panda appears to be panda-free. This entry was posted on September 17, 2018 at 3:12 pm and is filed under Clothing, Fashion, Language and animals, Modification, Modifier attachment, Spanish. You can follow any responses to this entry through the RSS 2.0 feed. You can leave a response, or trackback from your own site. I’ve posted an inquiry on the Wanda Panda site about the pronunciation of their name, but haven’t gotten an answer. I was under the impression that Wanda was pronounced with an exotic [w] (roughly like Bach in English pronounced with an exotic [x] instead of [k]). But there are several naturalization schemes, notably [u] as an extra syllable. Otherwise, a voiced oral labial in word-initial position would be [b] (Spanish has no /v/ distinct from /b/), or conceivably a voiced bilabial frcative [β].